IC Dressage » Winter Championships and beyond! Another jam packed week is coming to an end. We are currently at the British Dressage Winter Championships this week at Hartpury. 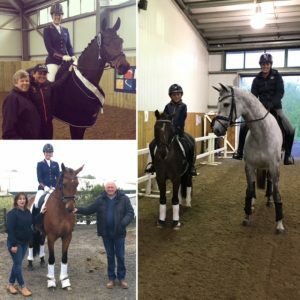 Charlotte has qualified five horses, and so far has won one class, and was third in another. Two more are competing today (Saturday) and one on Sunday afternoon. Then, once the competition is complete on Sunday evening, Charlotte and I drive to Heathrow and stay the night in a hotel and before flying out to America first thing in the morning! Now what’s that saying, no rest for the hmmm . . . . . ???!! !